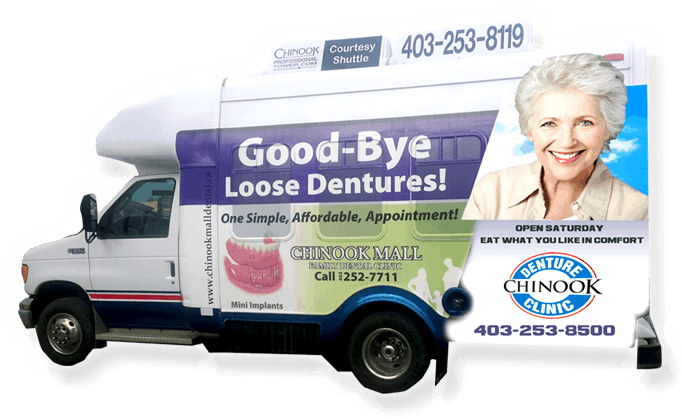 Dentures Replace Your Natural Teeth, Allowing for Normal Speech, Eating, & Appearance. There are several different types of dentures. Each is suitable for different applications. If you are unsure of which type of dentures are suitable for you, we suggest scheduling a consultation. We will assess your need and provide our recommendations. Complete dentures are designed to provide a natural appearance, enable you to maintain normal speech, and facilitate ideal chewing functions. Conventional complete dentures – These dentures are placed into the mouth after the teeth have been removed and your gums have healed (this process can take three or four months, during which time you are without teeth). 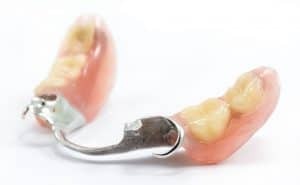 Partial dentures (aka a bridge) consists of replacement teeth connected to a base (usually gum coloured). This base can be plastic, metal, or a combination of both. Using metal mounting hardware, these dentures can be inserted into the mouth to fill gaps between your natural teeth. There are various types of partial dentures. Some, such as a fixed bridge, are cemented into place (for a comfortable fit and more natural appearance). In most cases, partial dentures can be removed and reattached as needed. Thought not dentures in the literal sense, dental implants are a more permanent solution than removable dentures. While providing a natural looking and permanent solution, dental implants are considerably more expensive than dentures. As well, not all people are candidates. In most cases, partial dentures can be removed and reattached as needed. 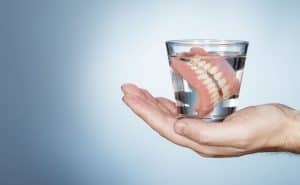 Dentures are made of an acrylic base, usually gum coloured, and artificial teeth that are made of plastic or porcelain. Metals used throughout the denture for its framework are usually stainless steel or a chrome-cobalt alloy. Dentures are made to different levels of detail and complexity. These changes in detail influence how natural and realistic they look and feel when worn. Learn more about how dentures are made.